PIZZA is officially the world’s favourite food. Indeed, what can beat a crispy pastry base topped with one’s favourite ingredients. Then again PIZZA making is an art and it is only with the best selected flours, the freshest ingredients, a wood burning oven and an experienced PIZZAIOLO that the best pizza can be baked. PIZZA has a history too. From its early, humble origins in the back streets of Napoli to levels of popularity it has reached today there are many stories to tell. More than anything there is PASSION and we at Vecchia Napoli are truly passionate about what we produce and we are eager to share this PASSION and spread the PIZZA message. Where better to begin than down at the bottom?! Vecchia Napoli will be hosting PIZZA classes for school children. 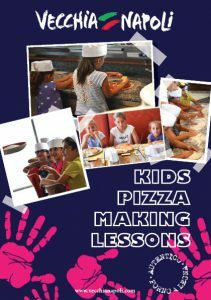 Kids can spread the dough, splash on the tomato sauce and then top up with whatever ingredient they fancy before they eat their fantasy PIZZA, after it is baked the traditional way in our wood-burning oven. The older kids may even get the chance to handle the PIZZA paddle themselves. This activity combines fun with food and exposes children to what PIZZA is really all about. Of course, each Pizzaiolo must have their own cap and apron, and these are provided. We are charging just €6.50 a head for this one and a half hour session. An innovative idea for school groups and private parties – guaranteed goodness in every way.